The ThinkSystem QLogic QL45214, QL45212 and QL45262 network adapters for Lenovo Flex System are based on eighth-generation Ethernet technology from Cavium and feature Universal Remote Direct Memory Access (RDMA) to offer concurrent support for RoCE, RoCE v2, and iWARP. The adapters are for customers looking for end-to-end 50 Gb and 25 Gb Ethernet speeds in their Flex System environment as well as those who want to maintain their existing 10Gb networking infrastructure while preparing for future upgrades to 25Gb or 50 Gb network speeds. This product guide provides essential presales information to understand the QLogic 25/50 GbE Flex adapters and their key features, specifications, and compatibility. This guide is intended for technical specialists, sales specialists, sales engineers, IT architects, and other IT professionals who want to learn more about the adapters and consider their use in a Flex System solution. The adapters are shown in the following figure. All three adapters look the same. 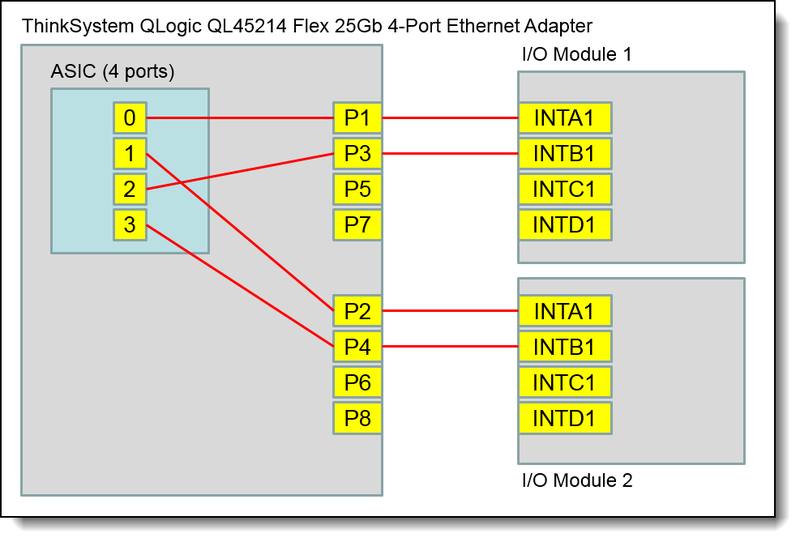 These QLogic adapters enable either 10/25GbE or 10/25/50GbE speeds for greater deployment flexibility. They also support switch-independent NIC partitioning, and the Universal RDMA feature means that the adapters support RoCE, RoCEv2, and iWARP, even concurrently, allowing you to seamlessly migrate from one technology to the other. The part numbers to order the adapters are listed in the following table. The QLogic 25 and 50 Gb Ethernet adapters are ideally paired with the new ThinkSystem NE2552E 25/50/100Gb Flex Switch for the ultimate in networking performance, however the adapters are also supported with most of the existing Flex System 10Gb I/O modules. This means you can buy new ThinkSystem compute nodes already enabled for high-speed networking and ready for when you upgrade the embedded switches in your Flex System Enterprise Chassis. The 25 Gbps Ethernet specification enables network bandwidth to be cost-effectively scaled in support of next-generation server and storage solutions residing in cloud and Web-scale data center environments. 25 and 50GbE results in a single-lane connection similar to existing 10GbE technology—but delivers 2.5 to 5 times greater bandwidth. Compared to 40GbE solutions, 25GbE technology provides superior switch port density by requiring just a single lane (versus four lanes with 40GbE), along with lower costs and power requirements. Cavium is a leading innovator driving 25 and 50 GbE technologies across enterprise and cloud market segments. The QLogic adapters support cutting-edge server virtualization technologies—single-root I/O virtualization (SR-IOV) and virtual NIC capabilities such as switch independent NIC partitioning (also known as NPAR or vNIC2) and Unified Fabric Port. With NIC partitioning, each of the physical ports on the adapter can be logically divided into four or eight virtual NIC (vNIC) functions with user-definable bandwidth settings. With SR-IOV, each virtual port can be assigned to an individual VM directly by bypassing the virtual switch in the Hypervisor, which results in near-native performance. The QLogic 25 and 50 GbE adapters support RoCE and iWARP acceleration to deliver low latency, low CPU utilization, and high performance on iSER and Windows Server Message Block (SMB) Direct 3.0 / 3.02. The adapters have the unique capability to deliver Universal RDMA to enable RoCE, RoCEv2, and iWARP. Cavium Universal RDMA and emerging low latency I/O bus mechanisms such as Network File System over RDMA (NFSoRDMA) and Non-Volatile Memory Express (NVMe) allow customers to accelerate access to data. Cavium’s cutting-edge offloading technology increases cluster efficiency and scalability to many thousands of nodes. These features provide ultimate flexibility, quality of service (QoS), and optimized host and virtual machine (VM) performance while providing full 25 and 50 Gbps bandwidth per port. Public and private cloud virtualized server farms can now achieve 2.5 to 5 times the VM density for the best price and VM ratio. Enterprise-class data centers can be scaled using overlay networks to carry VM traffic over a logical tunnel using NVGRE, GRE, VXLAN, and GENEVE. Although overlay networks can resolve virtual Local Area Network (VLAN) limitations, native stateless offloading engines are bypassed, which places a higher load on the system’s CPU. The QLogic 25 and 50 GbE adapters efficiently handle this load with advanced NVGRE, GRE, VXLAN, and GENEVE stateless offload engines that access the overlay protocol headers. This access enables traditional stateless offloads of encapsulated traffic with native-level performance in the network. Additionally, the adapters support VMware NSX and Open vSwitch (OVS). The QLogic 25 and 50 GbE adapters support the OpenStack open source infrastructure for constructing and supervising public, private, and hybrid cloud computing platforms. It provides for both networking and storage services (block, file, and object) for iSER. These platforms allow providers to rapidly and horizontally scale VMs over their entire, diverse, and widely spread network architecture to meet the real-time needs of their customers. Cavium’s integrated, multiprotocol management utility, QConvergeConsole (QCC), provides breakthrough features that allow customers to visualize the OpenStack-orchestrated data center using auto-discovery technology. In addition to OpenStack, the QLogic 25 and 50 GbE adapters support Network Function Virtualization (NFV) that allows decoupling of network functions and services from dedicated hardware (such as routers, firewalls, and load balancers) into hosted VMs. NFV enables network administrators to flexibly create network functions and services as they need them, reducing capital expenditure and operating expenses, and enhancing business and network services agility. Cavium 25 and 50GbE technology is integrated into the Data Plane Development Kit (DPDK) and can deliver up to 60 million packets per second to host the most demanding NFV workloads. Supported only by the QL45262 adapter. The Lenovo QL45262 adapter supports a hardware offload engine that accelerates FCoE and iSCSI storage protocol processing and enables the server CPUs to focus on applications, thereby improving the server’s overall performance. The following table lists the compute nodes that support the adapters. I/O adapter cards are installed in the slot in supported servers, such as the SN550, as highlighted in the following figure. The QL45000 adapters do not use transceivers or cables for connectivity to switches. Instead, the adapters connect to the Flex System switches and I/O modules installed in the chassis via internal connections. 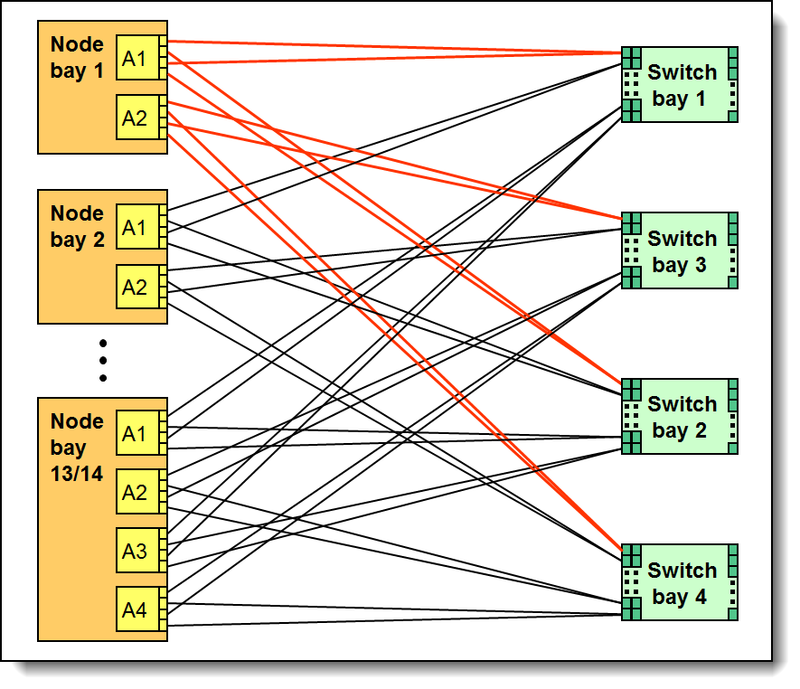 The following table shows the connections between adapters installed in the compute nodes and the switch bays in the chassis. The following figure shows the internal layout of the 4-port 25Gb QL45214 adapter, with how the adapter ports are routed to the I/O module internal ports. 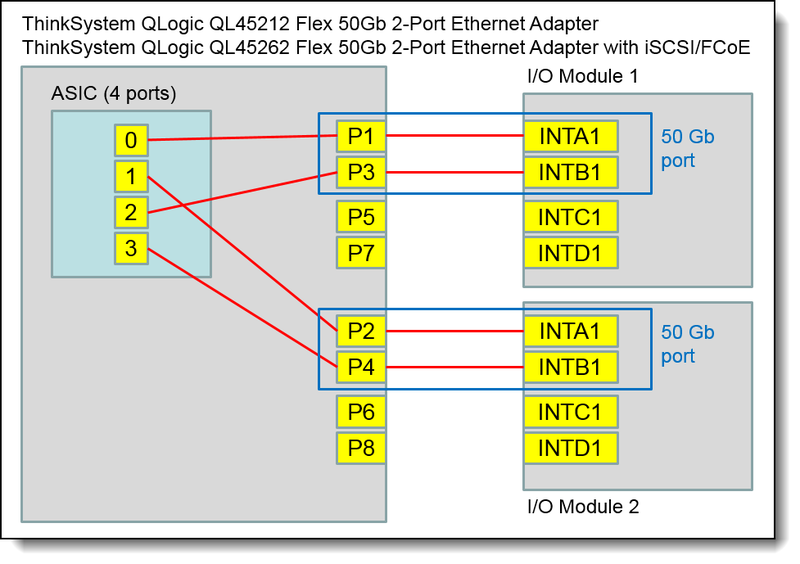 The following figure shows the internal layout of the 2-port 50 Gb QL45212 and QL45262 adapters, and how the adapter ports are routed to the I/O module internal ports. As shown, two 25 Gb ports are combined to form a 50 Gb connection. The connections between the adapters installed in the compute nodes to the switch bays in the chassis are shown diagrammatically in the following figure. The figure shows half-wide servers (such as the SN550 with two adapters) and full-wide servers (such as the SN850 with four adapters). These adapters can be installed in any I/O adapter slot of a supported Flex System compute node. One or two compatible modules must be installed in the corresponding I/O bays in the chassis. When connected to the 10 Gb switch, the adapter will operate at 10 Gb speeds. To maximize the number of adapter ports usable, you may also need to order switch upgrades to enable additional ports. Alternatively, for CN4093, EN4093R, and SI4093 switches, you can use Flexible Port Mapping, a feature of Networking OS 7.8 or later, that allows you to minimize the number of upgrades needed. The table below specifies how many ports the adapters contain. For the CN4054S, to enable all four adapter ports, either upgrade the switch or use Flexible Port Mapping. Switches should be installed in pairs to maximize the number of ports enabled and to provide redundant network connections. † This is the number of adapter ports that will be enabled per adapter, and requires that two switches be installed in the chassis. The adapters have a 1-year, customer-replaceable unit (CRU) limited warranty. When installed in a server, these adapters assume the server’s base warranty and any warranty upgrade purchased for the server.